Yesterday, the husband was sent on a mission to stop by the grocery store and buy a couple of things before company came over. On the list was toilet paper. Evidently additional details were needed. Now as much as I do love my Charmin, it can be a little pricey, so I will bend and go with Quilted Northern or Cottonelle, depending on which is on sale for the week. But we do have softness standards. Jonathan comes home with single ply Scott’s toilet paper. A leaf would have done a better job. But I played along until I got to the store the next time. My daughter went in the bathroom and came out quite disturbed. “Whoa! Whoa! Whoa! 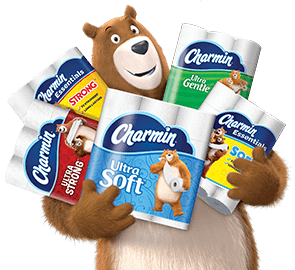 Where is the Charmin?” After a burst of laughter, I explained I would fix the situation at the store, but we still needed to use the paper dad had bought. She walked over to dad to have a serious, deep conversation about her toilet paper requirements, and explained that girls need this far more often than boys. “Dad, this is like paper on your bottom!” Needless to say, I think Jonathan understands the toilet paper softness requirements now. To add to this story, I think our dog is also a toilet paper snob. He loves to sneak in the 1/2 bath and grab the toilet paper off the holder and chew on a good roll of Charmin. I have not figured that one out…but I saw Zeke walk into the bathroom, play with the roll and walk away. Even the dog was not interested in the Scott’s single ply. Have I created these toilet paper snobs? Needless to say, I hope my daughter never ends up stranded in the woods with nothing by leaves for a wiping resource. This entry was posted in Parenting and tagged Charmin, Children, Kids, Parenting. Bookmark the permalink.